Notice how none of the others have the binding split that afflicted the latest one. I haven’t consciously treated this one differently from its predecessors or used it any longer. Maybe the quality control at Moleskine central has declined, although people have made claims in that direction for a very long time. Regardless of the reason, the latest notebook has about twelve usable pages left; I tend to write nonfiction, blog post ideas, things I need to remember, reminders about e-mails, entries from an unkept diary, and stuff like that in the back. Ideas, quotes, things people say, and other material related to fiction goes in front. When back and front meet in the middle, it’s time to get a new one. 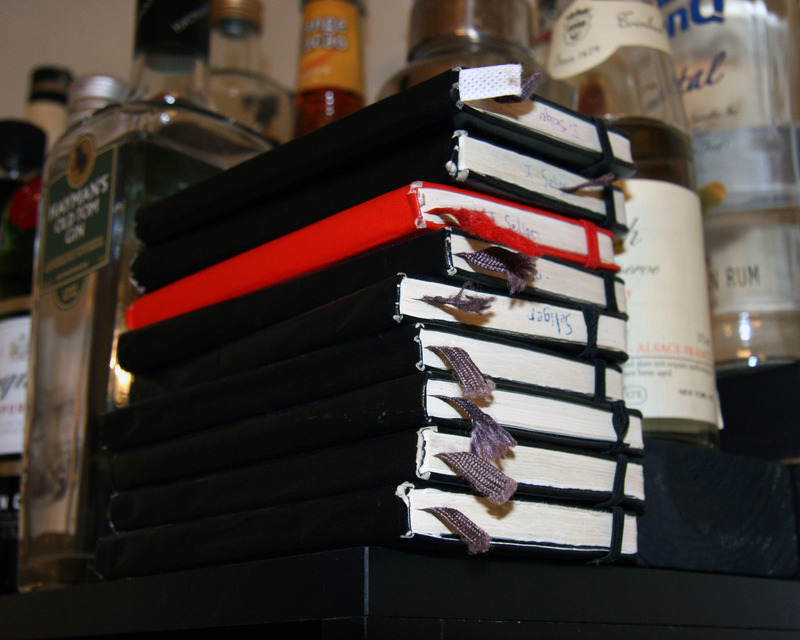 When I start working on a new novel, I usually go back through all the old notebooks at the beginning to see what material might be usable and when I started taking ideas for that specific project. Some ideas for novels have been burbling in the back of my mind for a very long time, waiting for me to have the time and skill to move them from a couple of scrawled lines to 80,000 words of story. 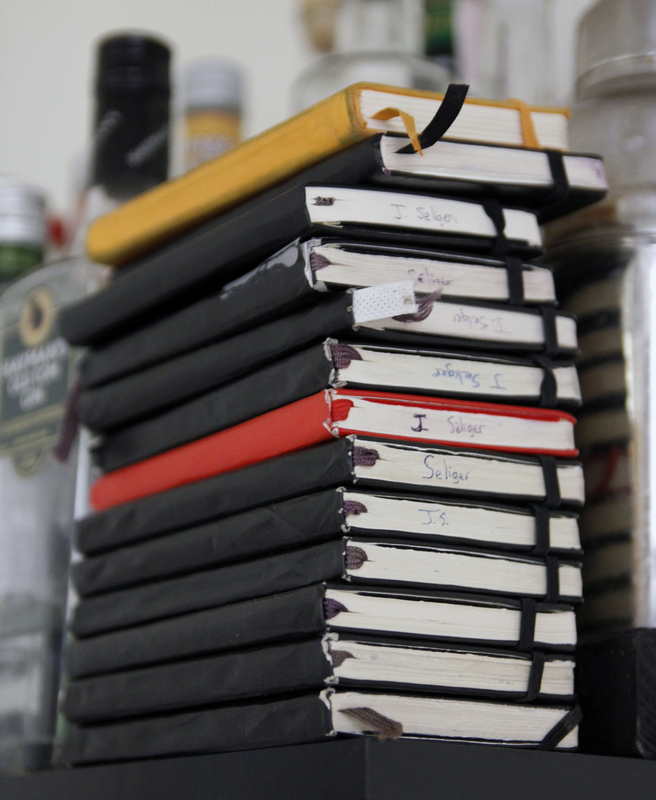 The oldest Moleskines I have were bought in the 2002 neighborhood. They’ve held up pretty well; the ones I started buying in the 2005 neighborhood are showing their age. Tough to say if this is an indication of falling quality control or something else altogether. While Googling around for the complaint about Moleskine quality I linked to above, I also found a site that recommends The Guildhall Notebook. I’ve already ordered one, although apparently Guildhall doesn’t have a U.S. distributor, so I have to wait for mine to ship from the UK. I hope the improved binding is worth the wait. EDIT 1: They weren’t worth the wait, or the hassle; if that weren’t enough, Christine Nusse of Exaclair Inc. /Quo Vadis Planners, which distributes or distributed Guildhall notebooks, said in an e-mail that her understanding is that the notebooks are being discontinued. She recommends the Quo Vadis Habana instead (although I think it too big) or a Rhodia notebook (which I think just right, as I said below. So even if you want a Guildhall pocket notebook, you probably won’t be able to find one for long; fortunately, the Rhodia Webbie is a better alternative. EDIT 3: I’ve settled on the Rhodia Webbie as a full-time notebook: it’s expensive but much more durable than other notebooks I’ve found. I’ll write a full review at some point. * Even describing it using conventional prepositions is tough: do I write “on” or “in” or “with” a computer? Good arguments exist for any of the three. The Moleskine paper quality has declined, too. Pingback: Our Town, and Not the Play: What Does The NEA Program Actually Do?